Develop a well-architected and well-documented REST API, built on a tightly integrated collection of Java EE-based microservices. 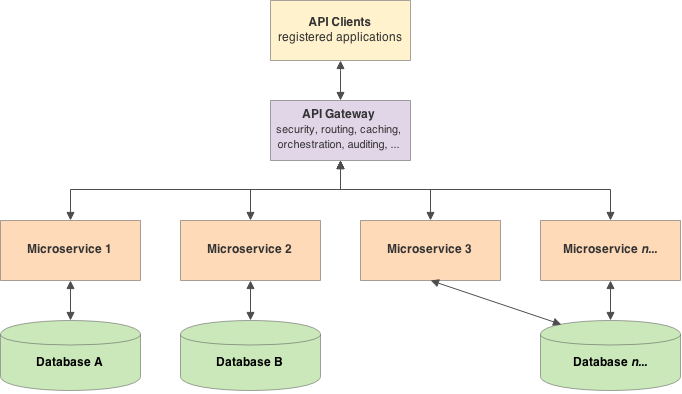 Martin Fowler and James Lewis (ThoughtWorks) have done an exemplary job capturing the essence of microservice architecture in their March 2014 post, microservices. Fowler has also discussed these principles in several presentations, including the January 2015 goto; Conference, Keynote: Microservices by Martin Fowler. Additionally, noted technical consultant and speaker, Adrian Cockcroft (Battery Ventures), has made significant contributions to the definition of microservices, such as in his December 2014 dockercon14 | eu presentation, State of the Art in Microservices. Lastly, Zhamak Dehghani (ThoughtWorks), delivered an in-depth discussion of microservices, including customer perspectives, in her October 2014 presentation, Real-World Microservices: Lessons from the Frontline. As we develop this post’s example, I will demonstrate how all of the above characteristics are implemented. An important nuance and differentiator from SOA-based APIs, RESTful APIs do not require XML-based Web service protocols (SOAP and WSDL) to support their interfaces (Wikipedia). The author of the WebConcepts channel does an excellent job capturing the essence of REST APIs in REST API concepts and examples. Two additional presentations I strongly recommend are REST+JSON API Design – Best Practices for Developers and Designing a Beautiful REST+JSON API, both by Les Hazlewood, CTO of Stormpath. Stormpath is a leader in the commercial REST API space. A microservices-based REST API is a REST API, whose HTTP requests call an orchestrated collection or collections of language-agnostic and platform-agnostic microservices. The combination of these two trends, microservices, and a REST API, offers a simple, reliable, and scalable solution for providing flexible functionality to an end-user, in a technology-agnostic manner. There is a fast-growing volume of reference materials describing the characteristics, benefits, and general architecture of microservices and REST APIs. However, in researching these topics, I have found a shortage of practical examples or tutorials on building microservices-based REST API solutions. Undoubtedly, the complexity of even the simplest microservices-based solution limits the number of available cases. A minimally viable solution require planning, coding, testing, and documentation. The addition of cross-cutting features such as security, logging, monitoring, and orchestration, creates an enormous task to build a practical microservices-based example. In the following series of posts, we will use many of the characteristics of a modern microservice architecture as described by Fowler, Lewis, Cockcroft, and Dehghani. We will combine these microservice characteristics with the best practices of good REST API design, as described by Hazlewood and WebConcepts, to build a minimally viable microservices-based REST API. In a future post, we will create an application, which leverages the microservices-based solution, through the REST API. Additionally, we will demonstrate how to ensure high-availability of the individual microservices and data sources. In a similar vein to the publicly available Twitter, Facebook, and Google REST APIs, we will build the Virtual-Vehicles REST API. 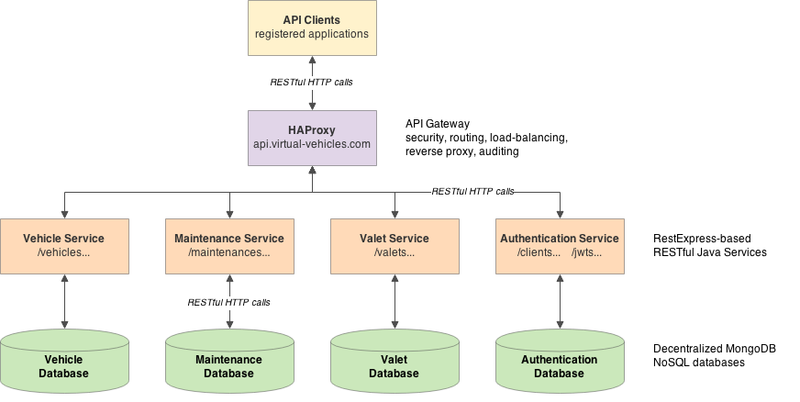 The Virtual-Vehicles REST API will constitute a collection of vehicle-themed microservices. Collectively, the microservices will offer a comprehensive set of functionality to the end-user, an application developer. They, in turn, will use the functionality of the Virtual-Vehicles REST API to build applications and games for their end-users. There are a seemingly infinite number of technology choices for building microservices and REST APIs. Your choice of development languages, databases, application servers, third-party libraries, API gateway, logging, monitoring, automated testing, ORM or ODM, and even the IDE, all define your technology stack. According to their website, RestExpress, composes best-of-breed open-source tools to enable quickly creating RESTful microservices that embrace industry best practices. Built from the ground-up for container-less, microservice architectures, RestExpress is the easiest way to create RESTful APIs in Java. RestExpress is an extremely lightweight, fast, REST engine and API for Java. RestExpress is a thin wrapper on Netty IO HTTP handling. RestExpress lets you create performant, stand-alone REST APIs rapidly. RestExpress provides several Maven archetypes, which we will use as a basis for our microservices. RestExpress will also drive our technology decisions to use Java EE, Maven, MongoDB, and Netty. For simplicity in this post’s example, we will only be exploring the (4) services shown above in bold. This segmentation of service functionality is unlike what we might encounter in traditional monolithic, n-tier applications, and SOA-based architecture. Traditional applications were built around application-centric functionality or business’ organizational structure. Microservices, however, are client-centric and built around business capabilities. The next decision we need to make is required functionality. What are the operational requirements of each business segment, represented by the microservices? Additionally, what are the nonfunctional requirements, such as monitoring, logging, and authentication. Requirements are translated into functionality, which is translated into the available resources exposed via the service’s RESTful endpoints. Reviewing the table above, note the first five functions for each service are all basic CRUD operations: create (POST), read (GET), readAll (GET), update (PUT), delete (DELETE). The readAll function also has find, count, and pagination functionality using query parameters. All services also have an internal authenticateJwt function, to authenticate the JWT, passed in the HTTP request header, before performing any operation. Additionally, all services have a basic health-check function, ping (GET). There are only a few other functions required for our Virtual-Vehicles example, such as for creating JWTs. I’ve labeled each function as to suggested user scope. Scopes include public, admin, and internal. As a consumer of the REST API, you may only want to expose certain functionality to your general end-user (public). Additional functionality may be reserved for an administrative user (admin) or only yourself as a developer (internal). Creating a new vehicle might be a common end-user feature. However, the ability to permanently delete one or more vehicles may be reserved for an admin-level user, or not exposed at all. We will not spend a lot of time discussing patterns for building REST APIs. There are many useful materials available on the Internet regarding industry-standard patterns for REST API resource URI construction. The two presentations I recommend above by Les Hazlewood, CTO of Stormpath, are excellent. Also, Microservices.io, RestApiTutorial.com, swagger.io, and raml.org websites offer solid overviews of REST patterns and RESTful standards. A common RESTful anti-pattern, which is hard to avoid as a OOP developer, is the temptation to use verbs versus nouns and method-like names, in resource URIs. Remember, we are not designing an end-user application. We are building an API, used by API consumers (application developers), to build a variety of platform and language-agnostic applications. Functions like paintCar, changeOil, or parkVehicle are not something the API should define. The Vehicle microservice exposes the update operation, which allows an application developer to change the car’s paint color in their paintCar method. Similarly, the valet service exposes the create operation, which allows the application developer to create a function to park the vehicle (or car, or truck, in a garage, or parking lot, etc.). A good REST API allows for maximum end-user flexibility. In Part Two, we will install a copy of the Virtual-Vehicles project from GitHub. In Part Two, we will gain a basic understanding of how RestExpress works. Finally, we will discover how to get the Virtual-Vehicles microservices up and running. This entry was posted on May 18, 2015, 7:07 pm and is filed under Enterprise Software Development, Java Development, Software Development. You can follow any responses to this entry through RSS 2.0. You can leave a response, or trackback from your own site. Nice post, good start to lern microservices architekture. Thanks!